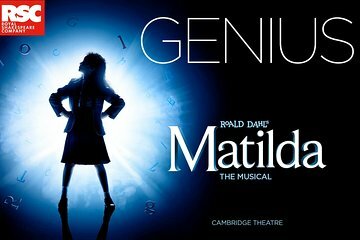 See Roald Dahl’s famous star Matilda live on stage in the West End with this ‘Matilda’ theatre show ticket in London. The much-loved children’s story comes to life in spectacular fashion and features all the characters you love and hate! During the show, see Bruce Bogtrotter struggle with his gigantic chocolate cake, admire the patience of mild-mannered Miss Honey and watch Matilda gradually master her mystical powers to triumph over her horrible parents. Enjoy fun for all the family with a magical music score courtesy of the talented Tim Minchin. Choose from two seating options for your evening’s entertainment — standard priced seating or top price seating. Then, head into central London’s West End in the early evening and settle into your seat at the theatre to enjoy the 2.5-hour show. Standard priced seats tend to be located in the rear stalls at stage level, whereas the top priced seats offer panoramic views. When the curtains rise, watch young Mathilda Wormwood live on stage and see the clever ways she deals with the terrifying Miss Trunchbull. With rave reviews from critics across London, the theatre adaptation of Roald Dahl’s classic book is a sure fire hit for kids and adults alike! Look on as the plotline unravels and the talented actors play out their roles under the lights. Laugh along to the witty script and join Miss Honey in song with musical accompaniment arranged by British-born comedian and musician Tim Minchin. Upgrade your ticket to enjoy a 2-course pre-show dinner at Jamie's Italian in Covent Garden, a restaurant located close to the theater. The show was great, I throughly enjoyed it, dinner at Jamies was okay the service was terrible. Im not sure its worth the price of getting the included dinner. Had seats in the very back row, and to be honest, I didn't really care for the play. Matilda the Musical was quirky and very entertaining! The props were fantastic...creative and effective. Choreography was clever and music up-beat. This show kept 3, 50 somethings entertained. Voices were suberb...the only criticism was that some of the diction of the children was hard to understand...they spoke very quickly and with high pitched voices it was hard to catch it all. Great atmosphere...cosy bars for a drink if you'd like too. We selected the dinner option and it was extremely difficult to find the restaurant. We stopped several places to ask where it was and they didn't know. When we finally found it after 30 minutes the restaurant didn't have a clue what to do with the voucher. They got the management and the management made some calls and they still said they didn't know what it was about. After about 20 minutes, they seated us and said that they would honor it. I was very disappointed. The show was great. Could have gotten cheaper tickets and better seats in London after we arrived. Took Viator Voucher to the ticket window, and picked up the tickets with no problem. We had very good seats, and the show was excellent. The Play was beyond brilliant but we already knew that - although the tickets were on the second mezzanine which I thought were not as good as what I expected. They were OK tickets - but for the price certainly should have been better. Now I got these tickets for a friend traveling with us. Thanks to our knowing one of the broadway producers of the show in NY we were able to get other tickets for ourselves that were outstanding. I just would have hoped that my friend would have been down with her son in Orchestra with us. So Fabulous show - don't miss the show.. request where the heck the seats are if you are paying for premium seating. and there were definitely some showstoppers. This show definitely lived up to all of its reviews. A must see for everyone!